Athena, daughter of Zeus, goddess of war renamed Minerva by the Romans? No, the Athena we're going to talk about, though destined to remain in seafaring history, has nothing or almost nothing to do with the mythological image we're acustomed to. 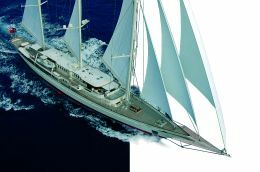 The 'almost' is obligatory because a certain parallelism with the Royal Huisman yard's "Athena" does arise spontaneously. Why? 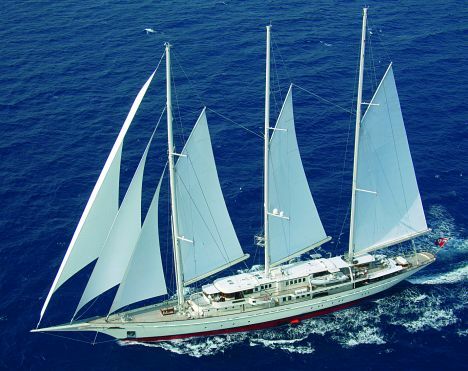 Because "Athena" is the largest private three-masted schooner ever built to date; because she represents a marriage between many yachtsmen's imaginative dreams and their rational ideas about modern sailing. Propulsion: two 1.60 metre diameter automatic variable pitch screws with four blades, hooked up to ZF 7540 NR CEW gearmotors. For further information contact Royal Huisman Shipyard BV, Flevoweg I, P.O. Box 23; 8325 ZG Vollenhove, Holland; tel. 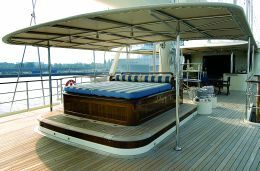 +31 527 243131; fax +31 527 243800; website www.royalhuisman.com; e-mail yachts@royalhuisman.com . A ship that ploughs the seas, driven by the action of the wind on the sails she has aloft. But of the antique she has only the fascination, because everything aboard "Athena" is of the most modern and avant-garde you could find at sea. For the Dutch yard Royal Huisman it is certainly no novelty to build a vessel that embodies this pleasing contrast which inevitably generates emotion in observers. But above all in those who have the fortune to sail her, to feel her standing up to the force of the wind, transforming it into movement, and feel her opening up the sea, eager to discover its boundaries. This is what we are dealing with, not any old vessel but one designed and created for someone who wants to sail the most remote courses, an owner who, having already possessed a sailboat from the same Dutch yard, entrusted the latter with the creation of a dream called "Athena", launched and therefore made reality in 2004. Also with this splendid specimen Royal Huisman created everything on its own premises, from the hull to the smallest detail installed. 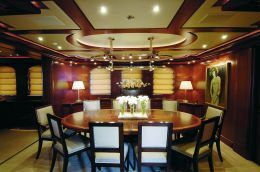 Gestation lasted four years and involved a work team rich in ideas with talents such as those of Peter Beeldsnijder for the exterior and interior layouts and the Gerard Dijkstra & Partners studio for the naval architecture. With a hull of no less than 90 metres Beeldsnijder could create spacious environments capable of offering hospitality in maximum comfort also for long periods. 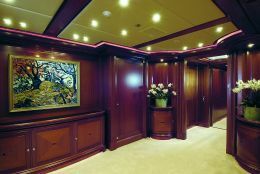 These environments were created with mahogany which emphasises the classic nature of this vessel designed on three decks. 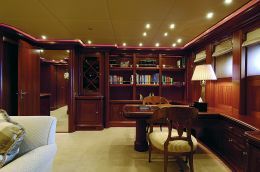 We shall begin with the lower deck which houses the owner's suite and the guest and crew accommodation and, in the mainmast area, the technical room that houses the two engines - Caterpillar 3516B of 2.000 HP each - the three main generators plus one reserve, plant for handling the numerous electromechanical and electro-hydraulic aids, control panels and safety systems. 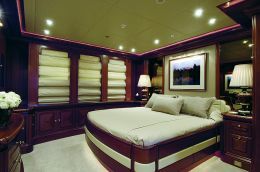 Forward of this area are the crew's quarters with a spacious dining and relaxation area, cabins and bathrooms, with plenty of space and highly liveable, finished with the same care found everywhere aboard "Athena". 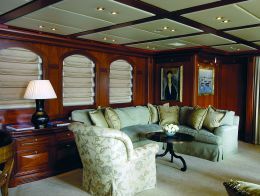 Aft of the mainmast area are the owner's suite and the guests' cabins, the former occupying the entire stern zone with a double bedroom, living area with L-shaped sofa and coffee table, an office corner with desk and two armchairs, two separate bathrooms, a shower cabinet, dressing table and bath in a separate space and a dressing room. The whole receives natural lighting from six portholes in the bulwarks for the night and relaxations areas plus another two in the room housing the bath. There are four guest cabins, three with double bed and one with twin beds, all with private WC and furnished with sofas for moments of relaxation. 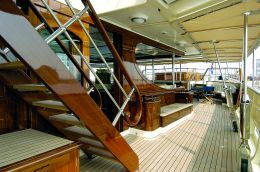 The main deck, partially covered by a superstructure created in perfect harmony with the overall aesthetics of the yacht, as one would well expect, offers generous spaces for enjoying life under way in absolute comfort, both in the open air and indoors. 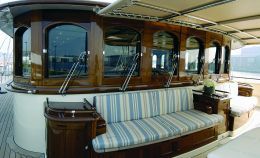 The aftermost zone has a spacious area dedicated to the handling the vessel while farther forward there are two corner sofas with table and armchairs. 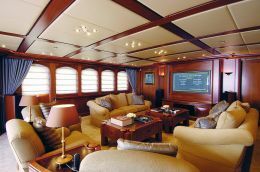 Proceeding forward we come to an open air living area, covered over by the extension of the upper deck and equipped with two relaxation corners with sofas and tables, a central round table and two companionways for external access to the upper deck. 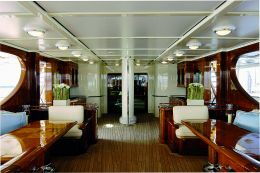 In the great deckhouse the indoor saloon stretches the entire width of the superstructure aft of the mainmast area. Here we find the dining room and, farther forward, a service area worthy of a hotel. On the same bridge the forward end of the deckhouse is occupied by an office and a hold for underwater gear, including a refilling point. 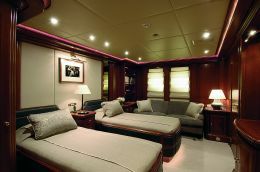 The final deck includes a lounge with sofas, armchairs and cinema aft, while the forward area is occupied by the skipper's cabin with double bed, private bathroom and direct communication with the bridge. It is worth pausing on the command bridge not so much for its size, which we might presume on a 90 metre vessel, as for the effective synthesis of the concept of ancient and modern which cohabit harmoniously and are expressed by this area. The antique flavour is certainly there in the view enjoyed from the windows of the superstructure, which also have the typical forms of the sailing ships of yesteryear and are vertical. But also in the wheel itself, situated externally at the forward extremity of the upper bridge and with bridge wings from which almost the whole sail plan can be observed. 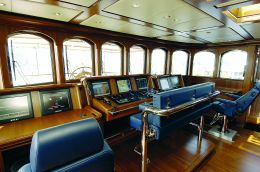 The modern is set in a classic context that highlights it, with latest generation apparatus for remote handling of hoisted sail area and various systems linked with steering the vessel, communications and plotting and maintaining the course. Outside on the upper deck there are two lifeboats, aesthetically and technically in line with the form and content of "Athena", meaning that the hulls are in classic form and colours but their characteristics conform with the international directives that permit "Athena" to be classified in accordance with the following regulations: MCA, Lloyd's *100A1, SSC, Yacht (P), Mono, G6, LMC, UMS and SOLAS. Hull and superstructures are entirely in aluminium, in conformity with the rules imposed by the protocols of the above classifications, as are all three masts. The mainmast and mizzen are equipped with internal rollers for the sails at their extremities. The booms are all in carbon fibre with an internal system of gathering in sail. The whole is controlled and handled by electromechanical systems, meaning that the imposing sail plan requires a relatively limited number of crew. Though the rig maintains classic type forms, in reality it was studied in depth to obtain performances in line with something that is not noticed about this vessel at a first, superficial glance: her modernity. We must consider that the vertical development of "Athena" at the design phase was not to exceed the 62 metres maximum height imposed by the Panama Canal bridge. Had we much more space than a magazine like ours can grant, we would surely have the impression of having left something out. But all in all, with a work of art words are always too many and at the same time never enough.